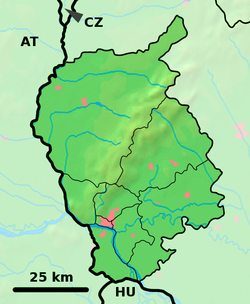 Budmerice (Hungarian: Gidrafa) is a village and municipality in western Slovakia in Pezinok District in the Bratislava region. The name comes from Slavic magnate name BudeměrЪ with Slavic/Slovak suffix -ice. The name was adopted by Germans as Pudmeritz what influenced also later Slovak name Pudmerice. In the 13-14 centuries, the name of Hungarian origin Kerestúr (1296 Keresthwr) had been also used in parallel, but was abandoned in favour of Slovak resp. German form (Pudmeritz, in 1899 renamed to Gidrafa). ^ Varsik, Branislav (1984). Z osídlenia západného a stredného Slovenska v stredoveku (in Slovak). Bratislava: Veda, vydavateľstvo Slovenskej akadémie vied. p. 109. This Bratislava location article is a stub. You can help Wikipedia by expanding it. This page was last edited on 29 March 2019, at 07:00 (UTC).